The concept of engagement has been fully explored in a series of questions that has been answered by His Eminence, the late Sayyed Muhammad Hussein Fadlullah (ra). Q: What does engagement stand for? Does it have any specific formula? A: Engagement represents a convention; it is the stage between the woman's acceptance to marry the person who proposes to her and her actual marriage to him. According to the social conventions, people are used to throwing parties to announce the engagement of the couple who pledged themselves for marriage. Therefore, engagement does not have any formula, and it is just a promise and not a contract between the two. Q: From an Islamic point of view, is announcement a prerequisite of engagement? How can the engagement fulfill its role in getting the couple to know one another? A: Islam does not consider the engagement to be a legislative agreement that leads to certain consequences. On the contrary, Islam considers it as a reality which means that a person proposes to marry a woman who agrees to marry him or authorizes her parents to do so. In this case, the man remains a perfect stranger to her and she remains a perfect stranger to him too, simply because it is the marriage contract that allows and obliges the couple to comply with the duties and obligations toward one another. Accordingly, it is not accepted that, under the title of engagement, the couple exceeds the legislative limits or do what is prohibited between the man and the woman such as shaking hands, having a lusty look towards one another, trying to see parts of the female body, or many other things that have become acceptable among people, especially among those who are religiously uncommitted. 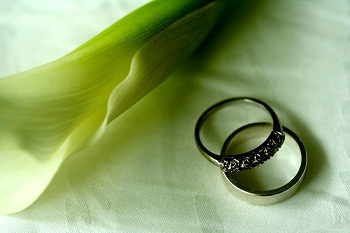 Therefore, if there is a long period of time separating the engagement from the official permanent marriage, then the couple can resort to the temporary marriage, so that they could know each other more and share their life together outside the wedlock, either under the parent's supervision or without it depending on what benefits them. Besides, the wife can impose her conditions on her temporary husband before marriage. For example, she can ask him not to exceed his limits in their relationship, if she wants. When the date of the official permanent marriage becomes due and her temporary marriage has not ended yet, then she can disclaim the temporary contract by asking her husband to grant her the remaining period. Consequently, they can begin with a new permanent marriage; this is in case the fiancés circumstances do not enable them to conclude a permanent contract during their engagement. But, if they are able to conclude a permanent contract immediately after engagement, then this would get them to further know each other before the wedding ceremony. Q: How can your saying that the two fiancés are perfect strangers to one another conform to the prophet's saying: "If you look at her you will be pleased"? A: Our saying that the two fiancés are strangers is related to what the husband is allowed or not allowed to do with his wife such as touching, looking, or doing whatever might happen in any natural relationship, and our saying that the male is allowed to use whatever means he wants to discover the beauty of the female's body whom he wants to marry and take as a wife are not contradictory. The future wife might be deformed, so the male has the right to look at her body to be sure that this is the beauty he wants. Nevertheless, if he becomes sure, he is not allowed to have a second look, neither is he allowed to do what is prohibited between the man and the woman. Q: If the two fiancés make a temporary contract immediately after they announce their engagement, should they keep it a secret or make it known? A: I advise that they adopt the announced permanent contract so that the period of engagement which is socially accepted would be accompanied by a marriage that is legally accepted. However, if that is impossible and the two fiancés have no other choice except concluding a temporary contract, then it is preferable not to announce it to avoid the social sensibilities that usually accompany such contracts. Q: Is it allowed for a man to propose to a woman knowing that she is wanted by someone else? In other words, is competition allowed in engagement? A: It seems that Islam rejects such competitions, just as it rejects competition in money exchange over a certain good, such as giving a certain offer for buying something, knowing that there is another one trying to buy it with a different price. It is not allowed for a person to propose to a woman knowing that another one is proposing to her and that she wants this person. He is not allowed to interfere in a way that he would ruin the chances of the other man and become a barrier that prevents his “rival's” marriage. He must wait until he is sure that the first proposal is rejected by the woman herself and by the parents as well. Some jurists go even further; they consider the act of proposing to an already engaged female as forbidden, especially if the woman wants the first fiancé. Abdullah Bin Omar narrated what he heard from the Prophet; he said: "The second man must not propose unless he is sure that the first one has really left or unless he takes permission from the first one. If this happens, it might lead to prejudice, hatred, betrayal, and the ending of the engagement." Q: In case a new man proposes to a woman whom she considers better than her first fiancé; is she allowed to end the engagement with the first? A: If the woman sees that her happiness and her interests are greater with the new man, who either has known or has not known about the first one, then she is allowed to do so. Although this act is considered immoral, since she has given the first one a promise (not a commitment) that she must keep; she has the freedom of choice. However, if either the man or the woman discovers that his/her first choice is not of the type he/she can live at ease with, or either of them has known another person who is more suitable, then it is allowed, juristically, for this person to leave the first one in order to get engaged to the other. Moreover, we all know the troubles the couples face and go through in case they are not totally convinced with each other. Q: It happens, sometimes, that a kind of coldness hits a long-period engagement, which leads the person to end the engagement with his fiancé, whom he committed with her for at least five years (for instance), what is the Islamic position toward this issue, and does it advise the interference of parents to reconcile? A. A long engagement is not advisable, whether it is with a contract or without one. Time is a problem for the female, but it is not for the male according to our social traditions. If the female exceeds a certain age, she might no more be desired by the proposing men; whereas the male is desired even when he reaches his fifties. Accordingly, the female must be cautious and take this point into consideration; she must not accept the extension of her engagement, unless she is hundred percent sure that her fiancé keeps his promise and would not divorce her or end their relationship. The fiancés, in this way, would live a relationship that would be void of depth and freedom, due to the psychological pressures they face during this long engagement, and this situation exposes the relationship to many problems and obstacles. Even if it is a deep relationship, it would be easily shaken because it is against the social conventions, in spite of its legality (in case there is a contract). However, if there is emotional relationship between them, they would be like a hungry person who is unable to eat although the food is in his hands. So, if the relationship is shaken, the parents must interfere to solve their problems. Alluding to the family to solve marital problems is something sacred in Islam. "And if you fear a breach between the two, then appoint a judge from his people and a judge from her people; if they both desire agreement, Allah will effect harmony between them, surely Allah is Knowing, Aware".(4:35). Q: An emotional long period of engagement might become so intimate that the woman might get pregnant. What could be done if this happens? A: Before falling into such a thing, the two fiancés must study well their relationship and must avoid pregnancy or the loss of virginity. If pregnancy occurs, it would negatively affect the female. The society does not approve of a complete sexual relationship between the two, as long as they have not moved to their own home. It is socially rejected, so the two fiancés must be cautious from falling into this situation. Therefore, some people resort to abortion in order to escape the embarrassment that is caused due to the social conventions. "But it is needless to say that abortion is prohibited in Islam". Q: For a successful engagement, what is required from both the parents and the fiancés? A: As to the fiancés, they are required to make a legal contract from the moment they decide to live together so that they would avoid social complications, criticisms, and feelings of guilt, which might result from thinking that they have deviated from the legal path. As to the parents, they should provide some freedom to the fiancés and should not chain them with restrictions. We know the conditions the parents are living and that they cannot turn a blind eye to their social conventions; but parents should, at the same time, understand that there is some freedom the fiancés are supposed to attain, in order to know each other before marriage. Both the parents and the fiancés must think well before taking this step so that their engagement could be strong enough to face the challenges and to prepare for a long life and happy marriage that would not be affected by any unexpected events.